Periódico is an newspaper typographic serif typeface created by Eduardo Manso and published by Emtype Foundry. Inspired by an old daily Spanish newspaper, Periódico comes with original typographic engravings that are functional and versatile at the same time. 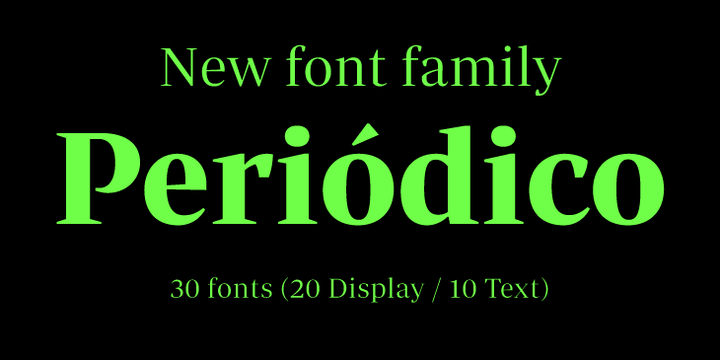 Featuring 30 different styles, from Light to Bold) and from Thin to Ultra Black, this horse powered family is capable of solving all the needs of a large publication. A font description published on Wednesday, March 20th, 2013 in Eduardo Manso, Emtype Foundry, Fonts by Andrei that has 4,036 views.